A lawsuit aimed at ending Baltimore’s use of non-disclosure agreements in police misconduct settlements was heard in the Fourth Circuit Court of Appeals in Richmond on Wednesday, the highest court so far to consider the First Amendment challenge brought by plaintiff Ashley Overbey and this website. Overbey, who was beaten, punched, kicked and Tased by police responding to her 2014 report of a burglary, lost half her settlement after she responded to online comments on a news story about her case. Baltimore Brew‘s efforts to report on these police misconduct cases, the lawsuit argues, have been hampered by the so-called “gag orders” – agreements requiring plaintiffs never to speak publicly about the case in order to receive a monetary settlement. 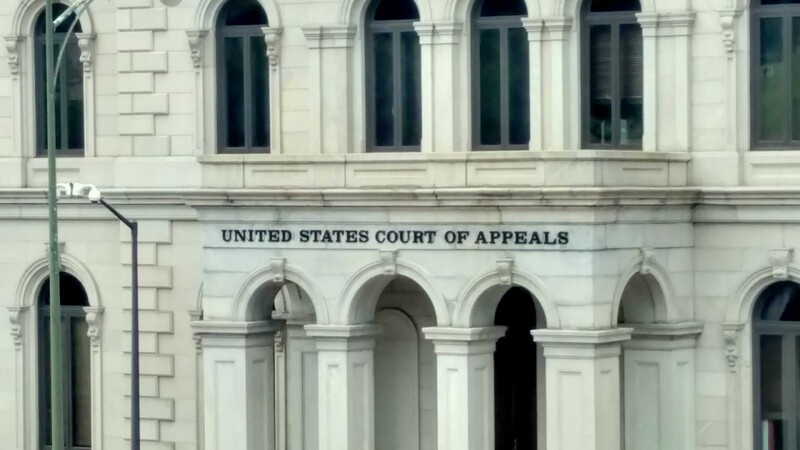 The agreements exist basically to enable Baltimore officials to suppress criticism on the use of force on citizens by police, one of the lawyers for the appellants argued to the three-judge panel. “It is pernicious to say, ‘We can’t make you shut up by legislation, we can’t make you shut up by executive fiat, but here, have some money and shut up,’” said Daniel W. Wolff, of the D.C. law firm Crowell & Moring LLP. “The suggestion in the brief that Baltimore in some fashion is trying to hide disclosures of police misconduct is simply not true,” said Davis, observing that city officials invited the U.S. Justice Department to conduct a “top-to-bottom, soup-to-nuts” review of the the BPD in 2016. In making these remarks, Davis was addressing former colleagues – he sat on this appeals court before taking the job as the chief lawyer for Baltimore in 2017. Filed in 2017 by lawyers from the American Civil Liberties Union of Maryland and Crowell & Moring, the lawsuit was eventually dismissed by a federal judge in Baltimore, who said that The Brew lacked standing and that Overbey had waived her First Amendment rights when she signed the agreement. Wolff took aim at that argument, saying that unlike a contract between private parties, these non-disclosure agreements between a government and an individual are by definition invalid because they restrict otherwise free speech. “The central question in the case is whether a government may, under the guise of contract, purchase the very silence the First Amendment prohibits it from restricting,” Wolff said. Wolff said past courts have upheld restrictions on speech in cases involving, for example, national security matters. But he said those court rulings also made clear there are limits to what kind of speech can be contractually suppressed. The city’s stated goals, to achieve “closure” and to avoid “being tried in the court of public opinion” are not a legitimate interest, Wolff said. U.S. Circuit Judge Marvin Quattlebaum, a Trump appointee, pressed Wolff, asking why an agreement Overbey entered into freely should not be honored? The law does not honor every agreement, Wolff pointed out. “A minor could enter into a land contract. That would not be enforced. I could agree with the mayor of Baltimore that if the city pays me $1,000, I’ll vote for the mayor. That wouldn’t be upheld as valid,” he said. In wide-ranging remarks, Davis said the lawsuit might be “moot” because of language changes made since it was brought and noted that the city has not, before or after this case, withheld settlement money because a non-disclosure agreement was breached. Asked by U.S. Circuit Judge Stephanie Thacker if he was suggesting that Overbey is now able to speak freely, Davis demurred. “I can’t answer. It would require me to reconstruct the history that never existed,” he said. Davis pointed out that the online comments by Overbey that cost her half her settlement money were made in response to comments by members of the public, not by the city. “They were really ugly comments,” Davis observed. Trying to turn the lawsuit on its head, he argued that plaintiffs have a right to withhold speech as well as speak out – and many people welcome the chance for a payout. “I can tell you 95% of them take it,” he said. At one point, Davis was asked by Judge Henry Floyd what public interest was served by keeping Overbey silent. Davis cited the “reputational cost” to the officers named in the lawsuit. He said allowing plaintiffs who settle to speak freely would harm the ability of the Baltimore Police Department to recruit officers. If a plaintiff was able to “trash” an officer after a settlement, Davis said, it could prompt an internal affairs investigation or affect the officer’s ability to get another job. Any officer who felt a plaintiff’s statements were defamatory, Wolff responded, would be free to file suit for defamation. Referring to The Brew’s part of the lawsuit, Davis reiterated the city’s contention that the news website “lacks standing” in the case. As stated in the complaint, the gag order has hampered efforts by journalists to report on police abuse cases because plaintiffs are reluctant to speak for fear of losing settlement money. The Reporters Committee for Freedom of the Press – along with 19 news organizations, including the Washington Post, Baltimore Sun and BuzzFeed – have filed an amicus brief supporting the lawsuit. Wolff said Davis’ acknowledgment that the city has modified some of its non-disclosure agreement policies since the filing of the suit strengthens the appellants’ case. “— was a problem,” Judge Thacker said, finishing Wolff’s sentence.